Each week that passes I get a little bit more into fall decorating, but so far I’ve managed to stay true to my favored color palette. 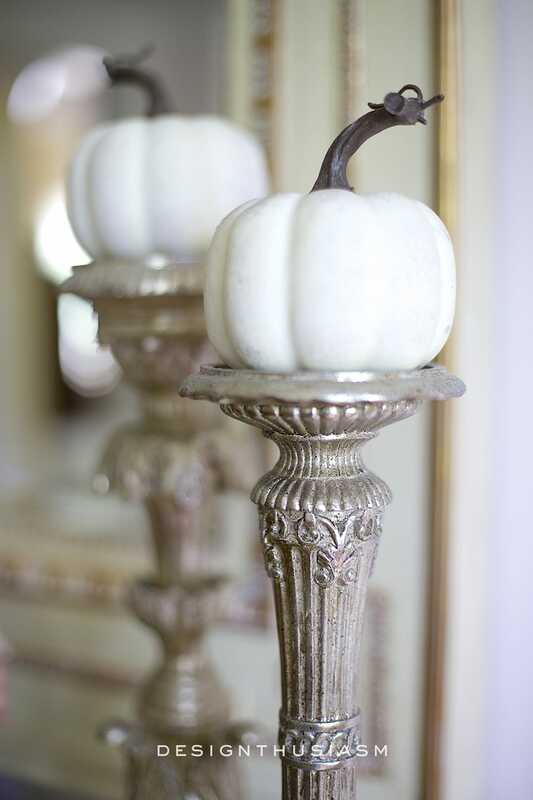 This week I’m ready to begin breaking out the pumpkins, albeit the creamy white ones, as my seasonal decor starts spreading throughout the house. 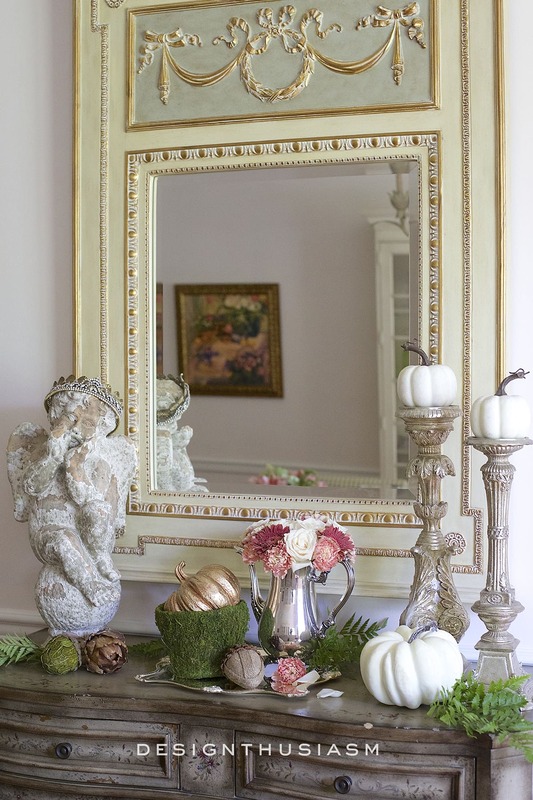 Here are 5 tips for creating a fall vignette in the dining room. 1. 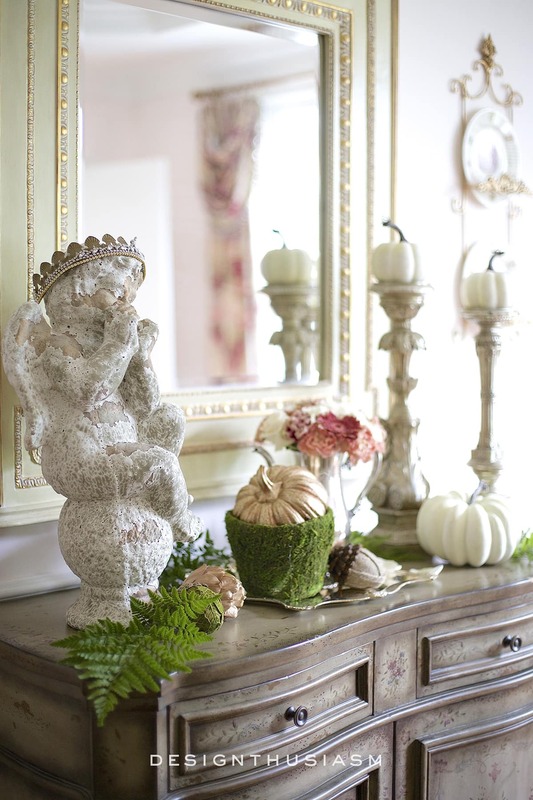 Greenery – I love for a fall vignette to have natural elements included to keep it looking alive and fresh. The mossy planter is faux, but the greens scattered about I purchased at the garden store. 2. 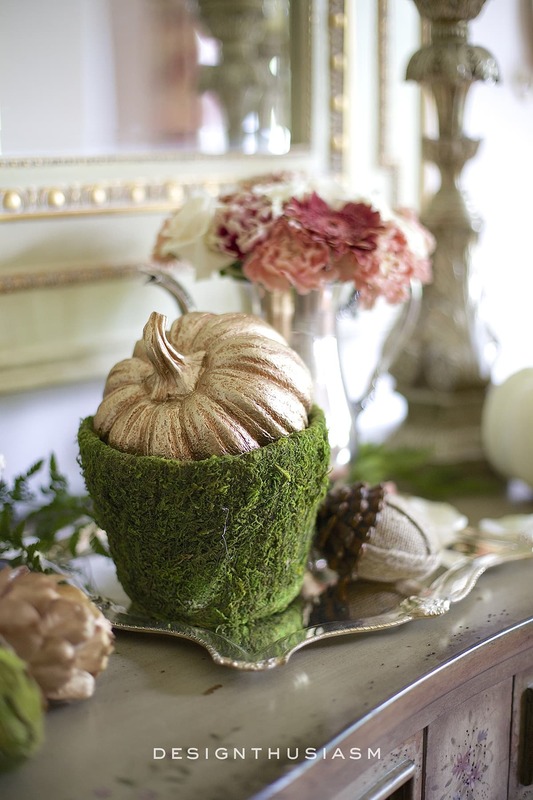 Pumpkins – This one, of course, is a no brainer, as nothing says fall quite like pumpkins. I’m partial to the white ones to coordinate with my decor, but I haven’t found the real ones yet, so I started off with a few from the craft store. 3. 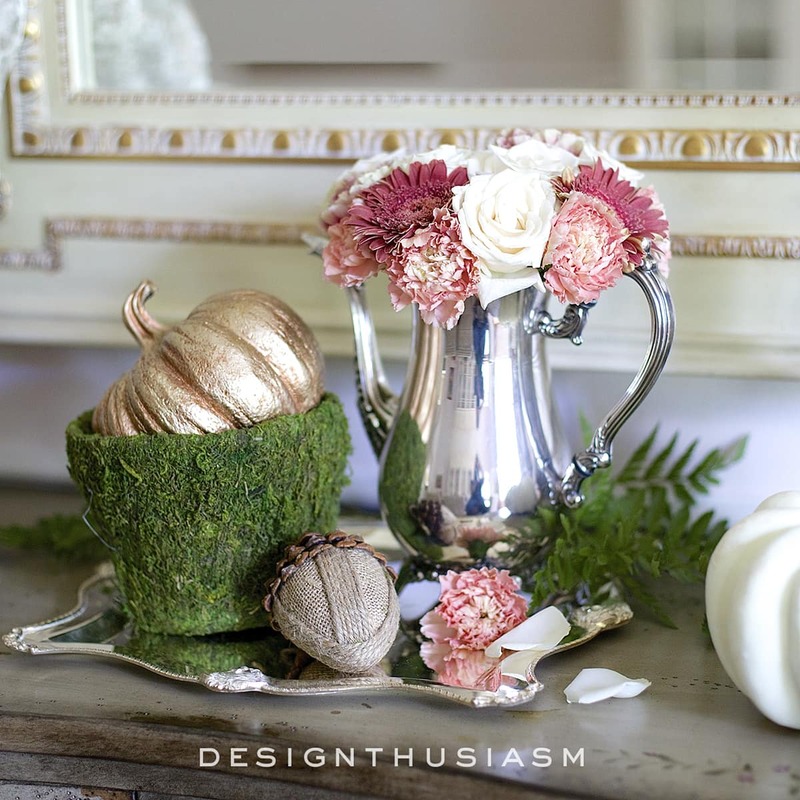 Florals – As summer fades, so do many options for floral arrangements, but I still think flowers are the secret to any beautiful vignette. I wanted to find blooms that would define my color story, so I searched until I found the blush pinks I was looking for. 4. Acorns, gourds and fall vegetables – The harvest season is the perfect time to feature these items that mature in the fall. 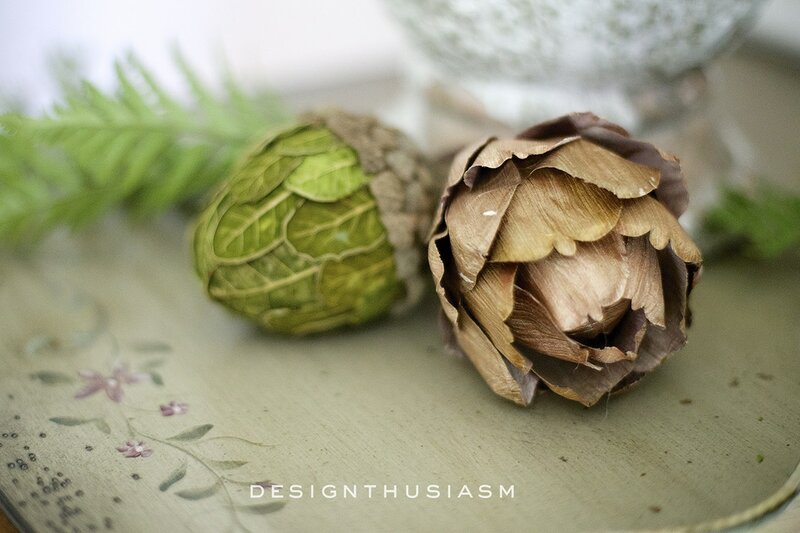 I bought these craft ornaments to add to my vignette (sources below). 5. 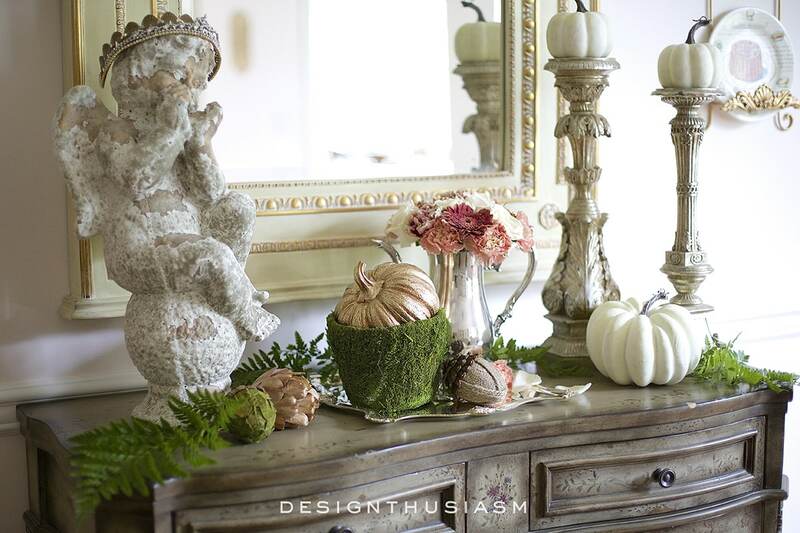 Elements unique to your personal style – A fall vignette should not only be seasonal and lovely, but it should also express your own design style. 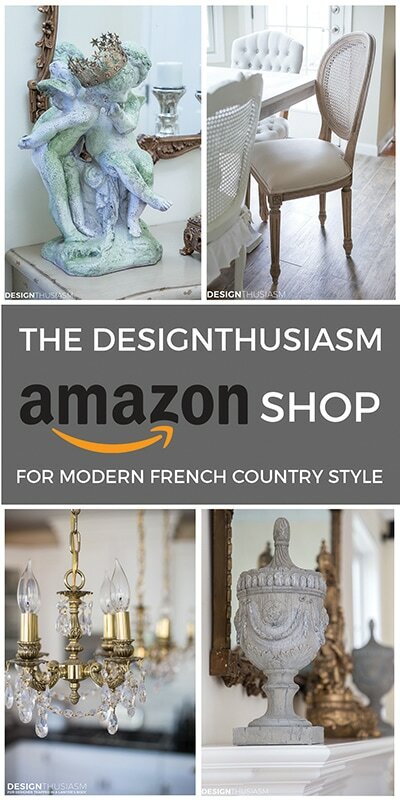 I try hard to ensure my vignettes don’t look like a carbon copy of what everyone else is doing, so I include my signature elements like the chippy statue, silver teapot and acanthus candlesticks. For each of us those items will be different, but they should always be our unique signature. 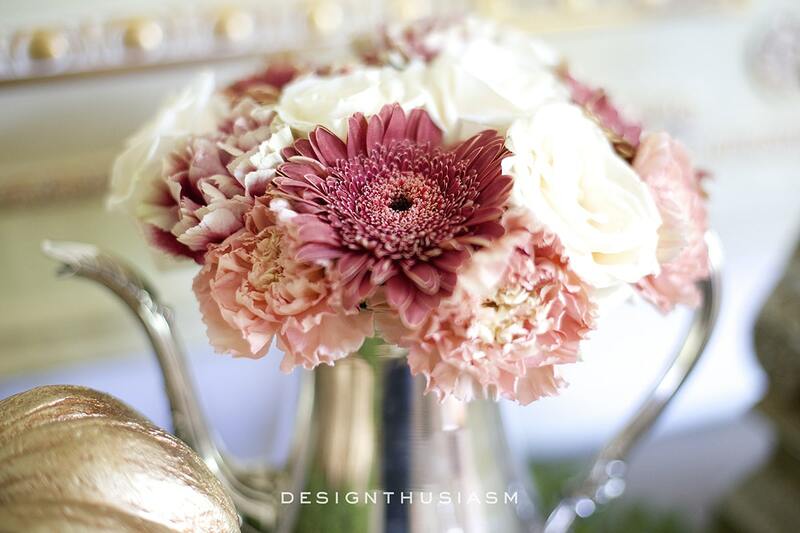 For the floral I used blush roses, mauve daisies and rose pink carnations. I really had my heart set on dahlias but they were not to be found. 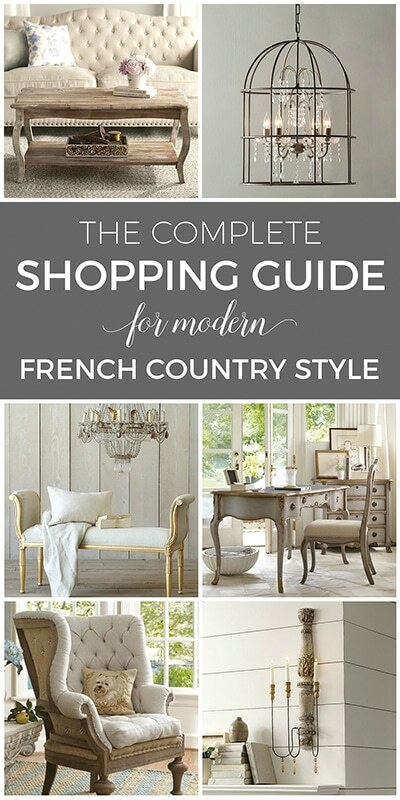 Beautiful vignette, Lory – and it’s so your style! Now that my kids are back to school I am starting to pull some things out for fall. I just wish the temps would cool off! 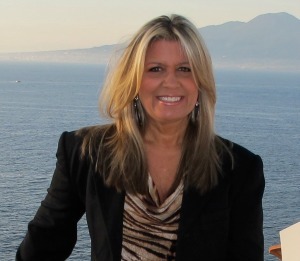 Thanks so much, Shelley! Truth be told, I’m happy keeping the summer weather and my pumpkins light and bright, but I’ll bet you’re more relaxed with the kids back in school… 🙂 Hope a lll is well!! 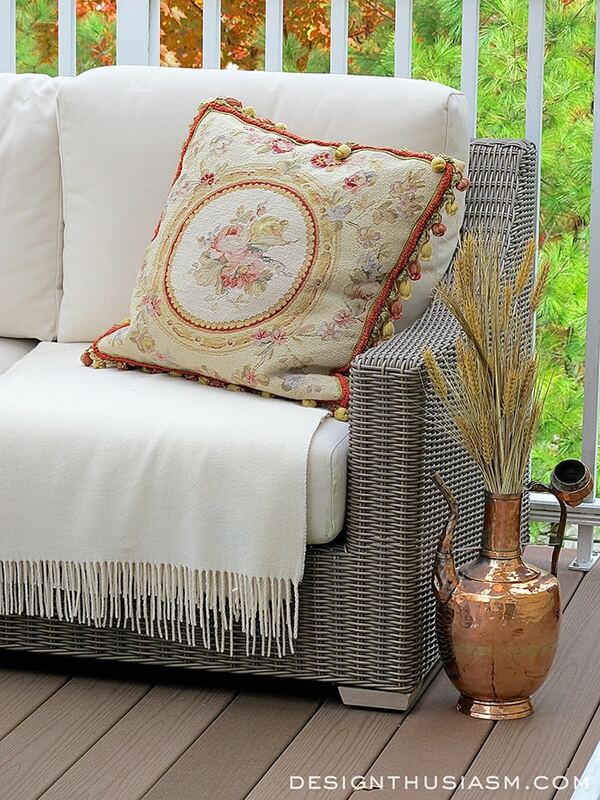 Lory, I love this vignette! 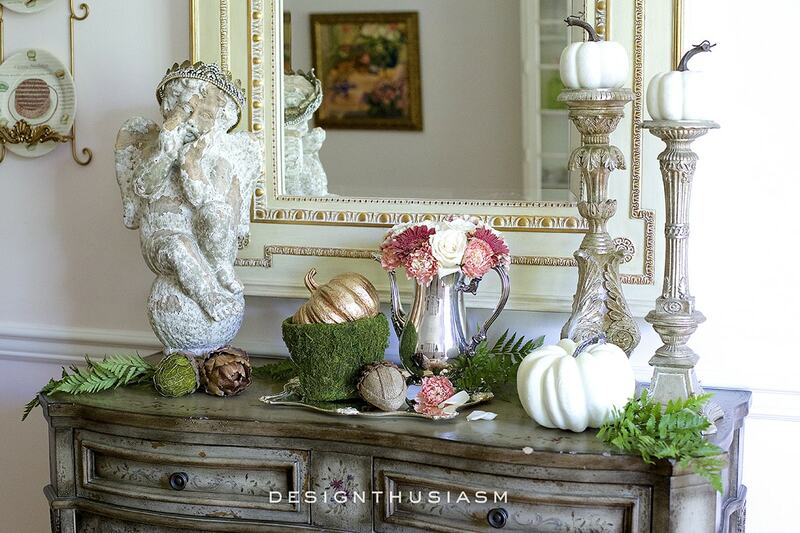 Maybe because I’m using those same soft fall colors and white pumpkins! Found a few very realistic faux blush dahlias at Hobby Lobby. My cat eats any and all fresh flowers or plants he can reach. So far that leave only the kitchen island. He just doesn’t know he can jump that high and I’m not telling him. I’m still grieving over a 15 year old bonsai. It looks so gorgeous! 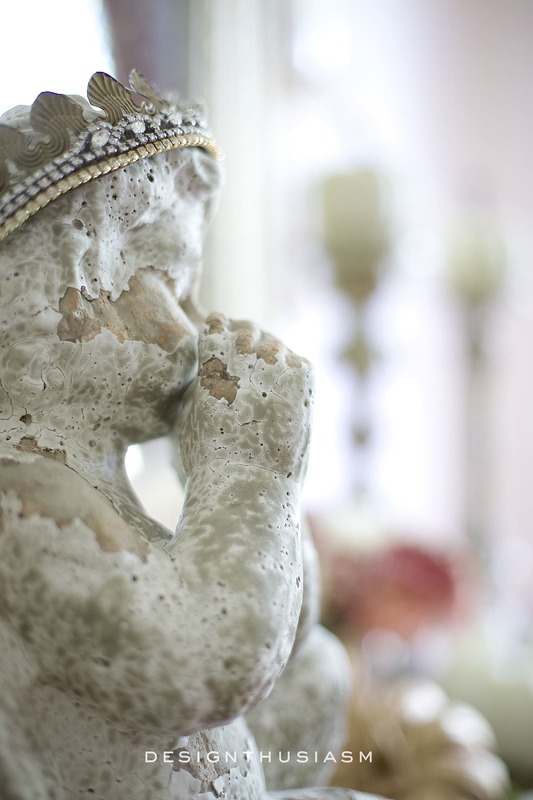 I clicked on through to see where you found that incredible little cherub with the crown. I should have known. I think this is the most perfect vignette…ever. Beautiful! Beautiful, Lory! Thanks for listing where you found your items because you always have such pretty and unique things, and I always wonder just where you find them. Hugs! Thanks, Bobbi! I do try to provide sources and if the exact is not available then something similar. It’s the question I get asked most… 🙂 Thanks, as always, for visiting!! 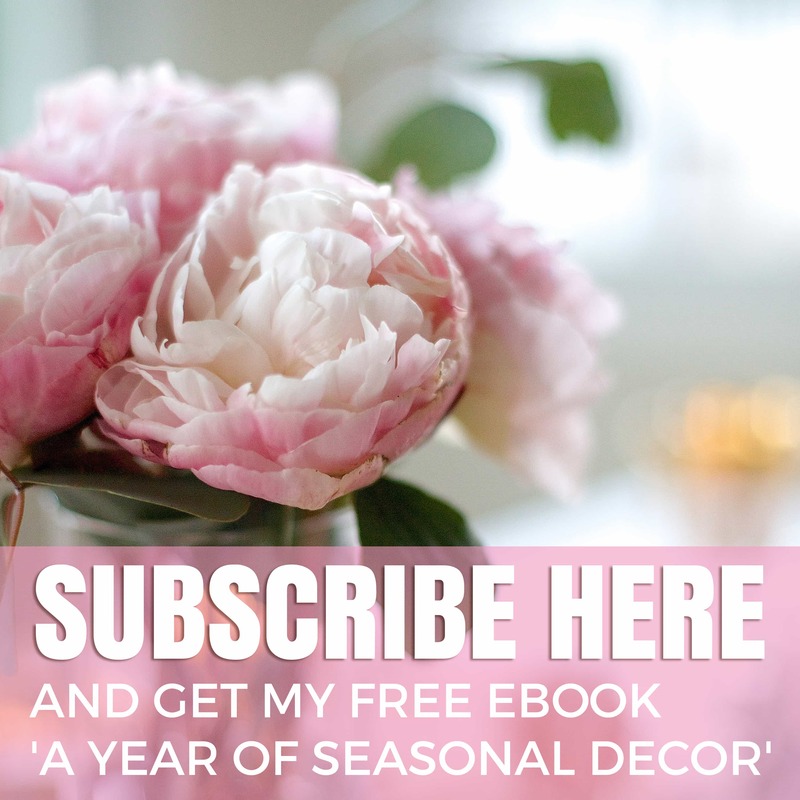 I agree Bobbi Nothing is any worse than to see a beautiful vignette or entire room, and not have the faintest idea of where to begin replicating. 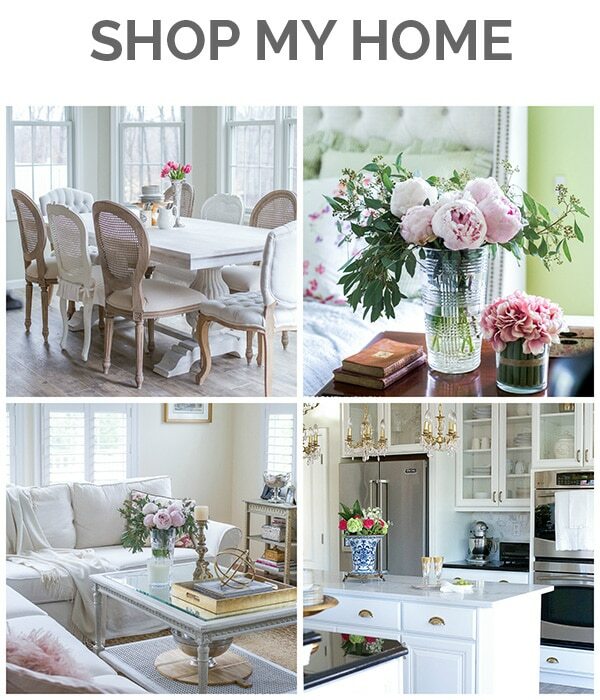 Anyone who follows Lory loves her home and style and loves her follow up with sources !! I love the colors you used! It’s nice to see fall decorations that are not orange. 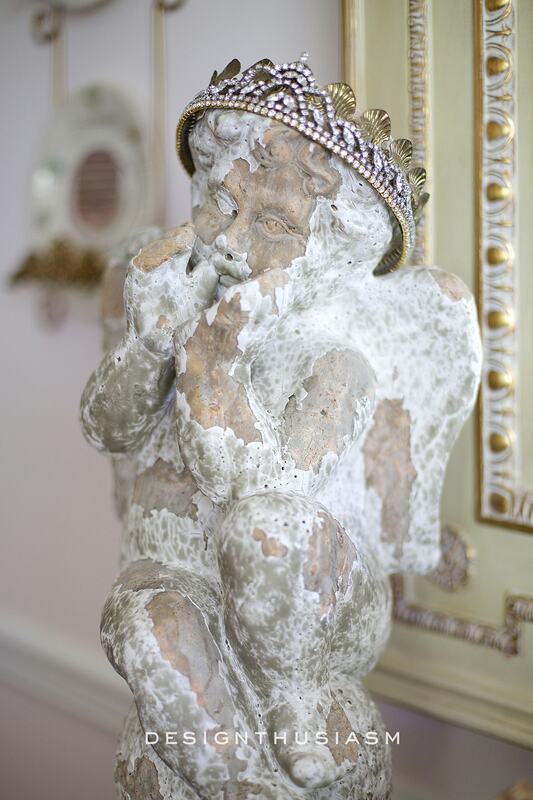 Your vignette looks beautiful….I’m crushing on that sweet cherub…….. Thank you so much, Maritza! I love garden statues and I’m looking for more… 🙂 They add such a nice chippy feel to a room, don’t they? Thanks for stopping by! 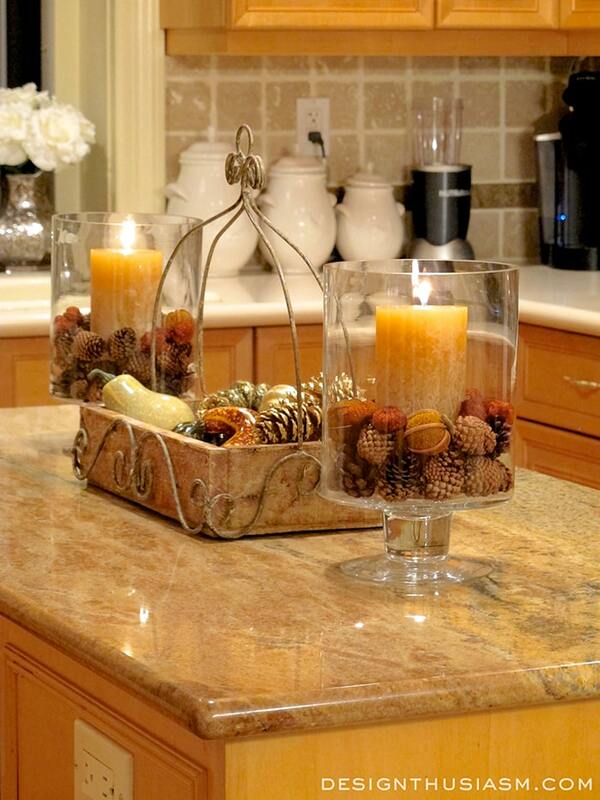 Your fall decor is stunning Lory. Classy and elegant. That’s so beautiful. I loved the colors and the way each element is set. I am reading through your blog all fours segments are special. It’s a great place to come to on the internet for inspiration. Wow, thank you so much, Phyllis, for such a lovely comment!! It means a lot to me to know my posts are resonating with people… 🙂 Please enjoy!! I love your arrangement Lory! 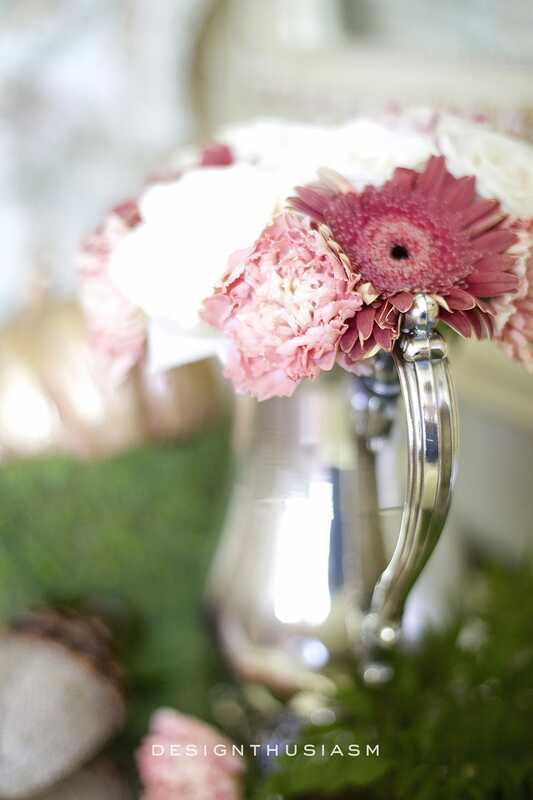 The statue, the blush pinks, and other natural elements are elegant and simple! And I spy something that’s given me an idea. Pinned. This is simply gorgeous. Well done! Hi Lory! 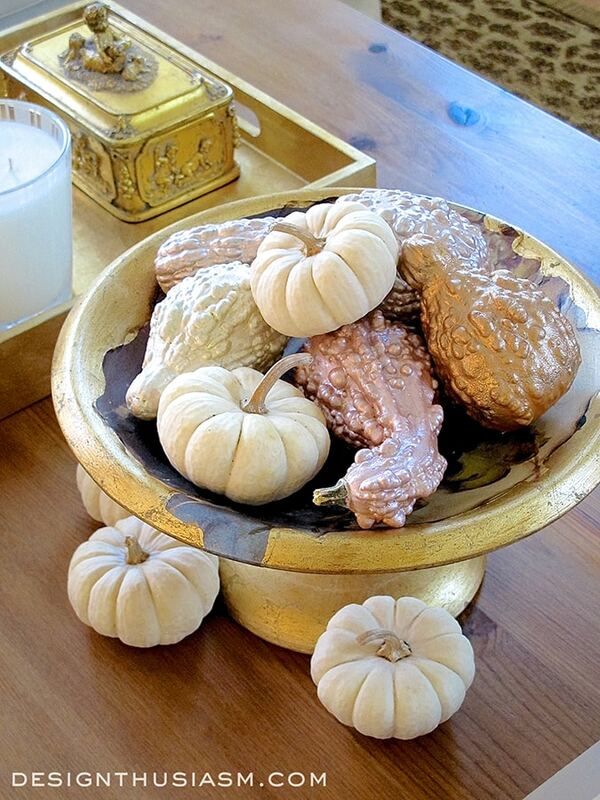 I’m glad you reposted this here at the very beginning of our late summer/early fall 2018 season ~ so much inspiration for fall decor. <3 Coming over from this week's Style Showcase.